This blog post is written by Paul Baines, Founder and Coordinator of the Great Lakes Commons Map. Since starting the Great Lakes Commons Map, (GLCM) I’ve had many conversations with people about what a commons is and what a water commons is. The Commons Map is a collaborative map, a crowdsourced project connecting those who care about the lakes and articulating what a Great Lakes Commons would be like. People can use text, photos, and videos to share their data, story, and curiosity, and it’s all grounded by place—by where it nests in the bioregion. While hundreds of communities, two provinces, eight states, and many First Nations make decisions that affect all 40 million residents of this basin, there is no cohesive protection plan nor guiding vision. The Commons Map unites upstream and downstream neighbors, reaches across political boundaries, and works in concert with the Great Lakes Commons community in this commons-approach. The vision of the GLCM is to grow deeper connections between this bioregion and its inhabitants through information sharing, discussion, and story. Place-based awareness, sharing, and organizing are the best methods for defending and restoring these waters because place is where water issues intersect with home. Adopting a commons approach deepens this work. For me, a commons is a shared agreement between people about gifts from the past and duties for the future. But how can we make this concept more accessible and grow this movement? Here is one example. Organized by Lost Rivers, I was one of several folks who painted a poem by Joyce Sidman in Toronto’s Trinity Bellwoods public park. You can see the painting in the accompanying photo, but what you can’t see is the constant stream of people we talked to about the city’s disconnection from its water reality (the park path is part of the buried but not forgotten Garrison Creek). So how does this park painting illustrate commoning, the act of making and strengthening the commons? The poem: The cultural commons shares the gifts of creativity, pleasure, tradition, education, memory, imagination, and relationship. Why do we have poetry? To express and share what our heart knows is true. Culture is how a community enlivens and understands itself. As a commons, culture is powerful because it is shared. The park: The social commons creates special places for rejuvenation. They are open to all and made according to the needs of those who use them. A small sample includes baseball, picnics, tennis, dog walking, sun tanning, and reading. Even the drinking fountain is optional and available. The city: Residents pool and redistribute their power and money to make decisions on land, laws, services, and transportation. Looking at transportation, we have the commons of public transit. There’s a flat fare, which is subsidized by commons taxes to offset the overuse of other prized commons (clean air, fossil fuels, and road use). Even our roads have a commons ethic. Traffic rules and infrastructure balance the diversity of public needs. They tell us what side of the road we should we drive on, how long and where we can park, where bikes get their own lanes, where we should stop at lights and intersections, and how fast we can drive. Commons need rules—otherwise they break down. The creek: The ecological commons is a web of life, and it gives us life, too. The Great Lakes were formed 10,000 years ago after the last ice age, and we were given one of the world’s largest sources of freshwater. Continuously moving, this water cycle comes together as creeks, puddles, lakes, tears, oceans, springs, and clouds. No one owns it, but we need a collective agreement to ensure its integrity. The police: The funny thing about this poem-painting is that we didn’t have a permit. Now, a commons is not a free-for-all; rules are needed, but overly tight restrictions and limits by the city and police may suggest that the commons belongs to them, rather than the people. Like all social services supported by taxes, the police are a commons agreement on who we want to enforce our rules. The Great Lakes Commons network needs your wisdom and passion for the commons. 200 year-old commercial and political institutions have failed our many commons. The issues facing the Great Lakes do not stop at quality and quantity. Let’s ask the radical question: What new institutions, practices, and ethics will guide a more bioregional, intergenerational, precautionary, inclusive, and sacred direction? Explore the words and links on the Great Lakes Commons site and the examples on the Commons Map. Add your own when it feels right. Paul Baines is the founder of the Great Lakes Commons Map, a participatory platform where people can explore the Great Lakes Commons. This article was posted in the Star Tribune on August 17, 2013. Read the original here. Driving into Kalkaska County, the welcome sign displays a picture of an oil well which is indicative of the history of oil and gas drilling in the county. FLOW’s Communications Director Eric Olson and I drove 30 minutes outside of Traverse City Monday afternoon to the neighbouring county of Kalkaska. Kalkaska is an economically depressed community and many closed stores on Kalkaska’s downtown are a stark indication of that. We met with Paul Brady, a ‘fracking watchdog’ according to media reports, who took us to see some of Encana’s well sites. The first well site we visited was the Excelsior 1-13 well in Excelsior Township, one of Kalkaska’s twelve townships. The site stores equipment and produces gas but minimal compared to some of Encana’s other well sites. But Encana has plans to expand the number of horizontal wells at this site. The development of the original site destroyed wetlands and some residents are concerned that Encana’s expansion will further destroy wetlands in the area. Kalkaska has become the centre of fracking in Michigan with more fracking permits and active applications than any other county in the state. What’s more, not only is Canadian company Encana planning to frack 500 new deep shale wells in the area but they are breaking records with the amount of water they are using to frack Kalkaska’s wells. According to the National Wildlife Federation’s report Hydraulic Fracturing in the Great Lakes Basin: The State of Play in Michigan in Ohio, most fracked wells in the Utica shale use between 7.5 and 22.7 million litres of water but Encana has reported that it used 45 million litres of groundwater per well to frack the Excelsior 2-25 and Garfield 1-25 wells and 80 million litres of groundwater to frack its Excelsior 3-25 well. Recent news reports revealed that Ecana wants to withdraw 15 billion litres of water for the 500 new wells they plan to frack. Michigan may soon be the state with the most fracking within the Great Lakes Basin, making Kalkaska County the centre of fracking in the Great Lakes Basin. Ohio and Pennsylvania are Great Lakes states with a significant amount of fracking but most of the fracking within these states occurs outside of the Basin. Next we drove down a dirt road called Sunset Trail and arrived at what Paul calls “Michigan's first superpad,” known as the Oliver pad. The pad currently has three wells, which were completed in November of 2011 and are now producing wells. There are five more to come, for a total of eight wells. Standing on a small hill just outside the Oliver pad, we saw Encana’s holding tanks of condensate and brine. The site is clean, neat and almost sparse, with no traces of the toxic mixture that Encana used to frack the three wells on site – a very different picture from when the wells were being fracked. But the real threat is what can’t be seen above ground. Encana will draw groundwater in Kalkaska resulting in the loss of approximately 1.1 billion litres from the North Branch of the Manistee River. The North Branch of the Manistee River, a coldwater trout stream, is roughly 1400 feet from where we stood looking at the fracked wells of the Oliver pad. As we walked on Sunset Trail which is in the Pere Marquette State Forest, Paul tells us the story of how back in May 2012, Team Services, a company contracted out by Encana, sprayed over 150,000 litres of fracking flowback on the very road we were walking on. We drove down a few roads and arrived at the North Branch of the Manistee River. It looks small and unassuming but is a tributary to the Manistee River, which itself is a winding river of over 300 kilometres that eventually snakes its way to Lake Michigan. As mentioned, Encana’s fracking projects will result in the loss of approximately 1.1 billion litres from the North Branch. Encana has other well sites in the county including the Garfield well in Garfield Township which used 45 million litres of water in December 2012 as well as the Westerman well site in Rapid River Township where residents have raised concerns about water well failures after fracking began. Encana’s proposed fracking plans are a threat to the county’s water sources, Lake Michigan and the Great Lakes Basin. The shorelines of Lake Michigan are already under stress, with Lakes Michigan, Ontario and Erie having the highest levels of cumulative stress. Several municipalities in Michigan have already placed a moratorium on fracking. As Maude Barlow points out in her report Our Great Lakes Commons: A People's Plan to Protect the Great Lakes Forever, while there are many political jurisdictions governing the Great Lakes Basin, it is, in fact, one integrated watershed and needs to be seen and governed as such. We need to work towards banning fracking around the lakes in order to protect the entire Great Lakes Basin. To read background information about fracking in Michigan, click here. To view more pictures from this trip, click here. 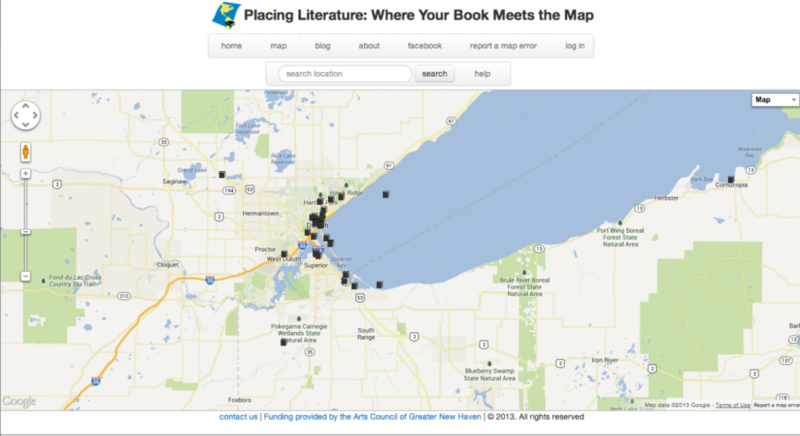 This post is written by Katie Williams of Placing Literature, an project connecting literature and geography and an ally in the effort to connect stories to place--many of which take place on the Great Lakes. Hello Great Lakes Commons, Meet Placing Literature. Placing Literature started as a project of Reintegrate New Haven, an effort that brought together artists and scientists to explore the many ways that art and science intersect and can inform each other. We brought together literature and geography. Placing Literature is a mapping application where readers can plot the places where the scenes in some of their favorite books are located. What does that mean? Anyone with a Google-login can go to PlacingLiterature.com and plot a place on the map. The idea of Placing Literature is based on place-based education, or experiential learning in place. There are two important ideas - one is that people learn through experience and that meaningful learning is connected to a place. Experiential learning works by taking ideas, making them real through concrete experience, and then connecting theory and experience through reflection and experimentation. We’ve created a tool to facilitate this process, people can read literature, connect the story to a place and write about it by placing it on the map. The place is important because the experience connects people to the place, and the place then has meaning. In other words, this kind of learning is meant to build connections between people and places. A place becomes a place (as opposed to a location, or a dot on a map) when it has meaning, or the space that has emotion attached to it. Our goal at Placing Literature is to explore place through literature and strengthen communities through shared experience. We want to enhance people’s long-term appreciation for their neighborhoods and cities, but also their lakes and rivers. We want people to not only experience their own cities and towns, but also have the ability to describe and share them. This is especially important for the Great Lakes, because the region is home to many great writers who love the Lakes and share stories about them. Take Danielle Sosin’s The Long-Shining Waters. Sosin weaves a tale of three women who live around Lake Superior at different times. Each woman’s connection to the Big Lake is profound and deeply experienced. When reading The Long-Shining Waters, you are connected to Lake Superior and you feel how it changes over time and how people learn to live in her mighty shadow. We hope to start a conversation about literature and community. We would like to know what are your favorite Great Lakes books? Why? We have lots of ideas of how a Great Lakes read could start conversations and begin to build communities built on sharing stories. We look forward to starting these conversations with you. Head over to Placing Literature to explore the map or add your own content. This article is written by Emma Lui and cross-posted from the Council of Canadians Blog. This article is cross-posted from the DC Bureau. Read the original article by Nick Cunningham here. The Indiana state government recently extended a deal with BP that allows it to continue to dump toxic waste into Lake Michigan. Back in 2007, it gave BP permission to increase discharges of toxic pollution into Lake Michigan as part of a $3.8 billion expansion of its Whiting, IN refinery. BP wanted to upgrade the facility to be able to process heavier crude oil, as Canadian tar sands began to flow southward in significantly larger volumes. Originally constructed in 1889 under John D. Rockefeller’s Standard Oil Company, BP’s Whiting facility is one of the nation’s largest oil refineries, a massive complex located in Indiana near Chicago. Indiana’s Department of Environmental Management granted an exemption from federal water protections to BP as part of its permit, which allowed to company to dump 54 percent more ammonia and 35 percent more toxic sludge into Lake Michigan. The permit also allowed BP to discharge 23.1 parts per trillion of mercury – 20 times the amount of mercury allowed under federal law. BP also consistently dumped other toxic chemicals such as benzene, lead, nickel and vanadium. Mercury is known to cause brain damage, especially in children. However, Indiana regulators justified the exemption because the refinery expansion would provide “important social or economic benefits” – in this case, the project would create a few thousand temporary construction jobs and 80 permanent jobs. Then Indiana Governor Mitch Daniels defended the decision. When asked if the giveaway would move forward, Daniels replied, “Yes. We’ve checked it and rechecked it. They’re in complete compliance with Indiana law, which is tougher than the federal law. The EPA has checked and rechecked it, and they have approved that permit more than once. To me, the public interest says it should go forward. The 2007 deal exempted BP from federal water pollution limits for 5 years. Under the agreement, BP was required to conduct research into technology that would reduce mercury pollution it discharged into Lake Michigan. It worked with the Argonne National Lab to explore new technologies. However, in 2011, as the original five year exemption neared expiration, Indiana regulators extended it because BP argued it would not be able to implement pollution control technology in time. Despite these assurances, pilot tests of new technologies found that mercury could be reduced to below federal limits. Yet BP asserts that the $21-$147 million price tag was too high – even though it expects to haul in an additional $1 billion in annual cash flow from the facility. To make matters worse, a recent draft permit would once again extend the allowance – this time indefinitely. The permit would not require BP to actually implement mercury-reducing technology. Instead, BP said it would continue to do research and would merely report back in 2015 on its findings. Meanwhile, BP finished its upgrade, allowing it to process an additional 250,000 barrels of crude per day. And it continues to pollute. Read the original article on DC Bureau here. The Ottawa Citizen reports that a plan to ship 16 radioactive steam generators through the Great Lakes and St. Lawrence River for recycling in Sweden has been cancelled after delays caused by public opposition. 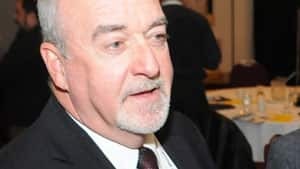 An agreement was reached in 2009 between Bruce Power in Tiverton, Ont., and Swedish company Studsvik but company president Duncan Hawthorne said they delayed the plans to allow further discussion with First Nations, Metis and other groups. The move has been strongly opposed by aboriginal groups, the Bloc Quebecois, the NDP and a number of community organizations over the past two years. Emma Lui of the Council of Canadians says there are many concerns but the "big one" is the possible threat to the Great Lakes if something went wrong with the shipment. The Canadian Nuclear Safety Commission had issued a transport licence and certificate to Bruce Power after determining the risk to the health and safety of the public and the environment was negligible. Bruce Power spokesman James Scongack said the nuclear facility "did not seek to renew" the licence after it expired early in 2012 but that the company remains committed to finding a way to recycle its waste. "This is by no means an indication that our position has changed on the importance of the reduce, reuse and recycle principle related to managing our waste," he said. Back in 2011, Ontario NDP Leader Andrea Horwath said shipping the used generators through the Great Lakes was not the right thing to do. "We think it's an unnecessary environmental and health risk to transport them,'' she said at the time. Lui says she would prefer for the radioactive material to stay on site so it could be monitored instead of shipping it overseas. Bruce Power has said about 90 per cent of the metal in the steam generators can be decontaminated, melted down and sold back into the scrap metal market. The rest will be returned to the Bruce Power site for long-term storage. Each steam generator contains 100 tonnes of steel but less than four grams of radioactive substances. But Lui says there was concern "about whether or not the radioactivity could actually be removed from the material." Studsvik announced the agreement to ship the 16 giant steel cylinders — around the size of school buses — from their Tiverston plant to Sweden had been cancelled in an interim report released last week. Scongack says the cancellation is just a commercial position to recognize the fact that the original timetable for moving the steam generators had changed. While he says there are currently no official agreements with Studsvik on another plan, any future plans will move forward with transparency. "If we do ever decide to proceed, we will be the first to let people know," he said. But for opponents to the plan like Maude Barlow, national chairwoman of the Council of Canadians, the cancellation of the plan is good news. "This is a huge victory for communities around the Great Lakes," she wrote in an email. "The Great Lakes belong to everyone and communities have a right to say 'no' to any projects that will harm them." "Federal programs designed to make headway on some of the Great Lakes' most longstanding ecological problems, from harbors caked with toxic sludge to the threat of an Asian carp attack, would lose about 80 percent of their funding under a spending plan approved Tuesday by a Republican-controlled U.S. House panel." So reads a Minneapolis Star Tribune article about the House of Representatives plan that would set back years of bipartisan work to ecologically restore the Great Lakes. The Great Lakes Restoration Initiative was established in 2009 by President Obama and would suffer greatly under the proposed bill. The list of cuts named in the bill include reduced spending on projects that upgrade aging sewage treatment systems (which protect citizens from harmful bacteria like E. coli), scrape away contaminated harbor sediments, restore wildlife habitat and support efforts to ward off invasions of Asian carp. Critics of the proposed reductions cite the negative health impacts of reduced spending on sewer systems, the cultural significance of the Great Lakes and the positive economic impact that the Great Lakes bring to surrounding communities. "The Great Lakes is one of the jewels of the United States and it's imperative we protect it for its environmental significance but also because of its economic might," the Star Tribune reports Rep. Dave Joyce, an Ohio Republican and member of the subcommittee, as saying in a news release announcing the bill introduction. "Studies have shown more than 1.5 million jobs are directly connected to these five lakes, generating $62 billion in wages. Read the entire Star Tribune article here, and consider the wide-ranging consequences that political gridlock and sequestration have on what ought to be our protected commons. Copper Harbor, MI, recently hosted the Upper Peninsula's first Lake Superior Day celebration as reported by the Mining Gazette. Dijkstra said he's working on ecosystem models of environmental challenges to Lake Superior, including invasive species, such as Asian carp, and the effects of excess nutrients entering the lake. "Lake Superior is common," he said. "It's owned by us all. It's not a commodity." Addressing some of the approximately 200 people attending the event, Dijkstra said he's encountered some people from out of the area who behaved in ways detrimental to the lake, and he thinks people who live here have an obligation to inform others who may be involved in such activity. "It's all our job to reach out to people who don't have a beautiful lake in their back yard," he said. "This is a really important part of our job as stewards." A story playing out across the Great Lakes makes it clear that we can't make decisions locally and individually--we need to make them as a commons, and share the decision-making process with all those involved. A small wealthy suburb in Wisconsin wants to draw on Lake Michigan for drinking water, but has failed to see that water is held in a larger commons--one that includes all of those who depend on that water in the entire bio-region. Although extracting the water from the lake for the community, whose aquifer is running out of fresh water, would be "the equivalent of taking a teaspoon of water out of an Olympic-sized swimming pool" (as the general manager of the local water utility said), if each community does so we will continue to the lakes shrink. Thunder Bay Mayor Keith Hobbs, chair of the Great Lakes and St. Lawrence Cities Initiative, recognizes the issue. "We're already looking at low water levels in Lake Michigan, Lake Huron. And those levels are really having an effect on all kinds of things." The situation has also upset nearby communities who are not on the shores of the Great Lakes and who wonder how they will sustainably draw water in the future. "Where do you draw the line," Hobbs asked. "I could see water wars coming if [we don't resolve the issue]." Perhaps this case will help awaken more people to the need for a commons approach to the waters. We are all connected through the Great Lakes, and we need to embrace shared use, shared stewardship, and shared governance in our relationship to the waters. This article is cross-posted from FLOW for Water. A PDF report is available here. Click here to join the rally on July 14! What company is stealthily completing this hazardous energy venture with limited public scrutiny? Enbridge—the same Canadian company responsible in 2010 for a million gallon tar sands oil pipeline rupture and a $1 billion cleanup along a 35-mile stretch of Michigan’s Kalamazoo River. Known as the largest transporter of crude oil, Enbridge is requesting a permit from the State Department’s U.S. Transportation Department’s Pipeline and Hazardous Materials Safety Administration (PHMSA) to expand its existing pipeline—Line 67 also known as the Alberta Clipper—to transport heavy tar sands oil originating from Alberta, Canada to Superior, Wisconsin. From there, Enbridge, according to company officials, has already expanded the volume of tar sands oil in a second pipeline—Line 5—that travels directly through the Straits of Mackinac to a refinery located in Sarnia, Ontario. This 1,000+ mile pipeline route will double the tar sands oil that it currently carries and will deliver even more tar sands oil than the highly publicized and controversial TransCanada Corp’s Keystone XL pipeline. Looking for something concrete to do about this pressing pipeline issue? Join FLOW, TC350, 350.org, National Wildlife Federation, Michigan Land Use Institute, Food & Water Watch, and many other organizations and attend the Oil and Water Don’t Mix: A Rally for the Great Lakes on July 14th at the St. Ignace Bridge View Park, just north of the Mackinac Bridge. The purpose of the rally is to bring attention to the dangers of this pipeline and its expansion, and to organize a response to these risks. We want to pressure our leaders to put safety measures in place to prevent a devastating oil spill in the heart of the Great Lakes. Click here to sign up and RSVP via this Facebook event. A Canadian firm is planning to drill 500 new wells to harvest natural gas from northern Michigan, as reported by the Bridge Magazine. Fracking has become "cloaked in controversy" in part because of the effect of Fracking on the water required for the process. The water is mixed with chemicals, sand and other materials, then blasted into rock formations underground, releasing natural gas. The contaminated water is then left underground, seeping into groundwater reservoirs and nearby water bodies. In addition to contaminating water, the fracking process simply requires massive amounts of the precious liquid. Encana Corp, the firm planning 500 new wells in Michigan, is projected to require 4 billion gallons of water for their operation, as much as a small town uses over two years. The high social and environmental costs of fracking begs us to ask ourselves--is it worth it? Earlier this year, we featured an interview with Ojibwe leader Sharon Day as she walked along the entire length of the Mississippi River as part of the Mississippi Water Walk. Sharon and her companions completed the journey, but are still working hard to advocate for a healthy future for water. Although this is walk was not directly about the Great Lakes, Sharon's words and actions can be an inspiration for us all. The following is an excerpt from an interview with Sharon on Resilience.org, written by Jessica Conrad. Read the full interview here. Sharon Day carrying the eagle feather staff and copper pail of water. Photo credit Kevin E. Schmidt. When I heard you speak at an event this winter, you gave a brilliant answer to someone in the audience who asked a simple question: Why? Why walk the length of the Mississippi River? I’ve been asked this question many times, and my answer is usually this: if I were a lawyer or a hydrologist I might be doing something different, but I’m neither of those things. I am an Ojibwe woman, and my responsibility is to take care of the water. I can walk and I can pray and I can sing. And that’s what I have chosen to do. Today many people seem to have a material relationship with the water, and yet others have a highly spiritual relationship with it. Can you share your perspective on our collective relationship to water today? Today we’re missing a spiritual connection to the water because all we have to do is turn on a faucet. It’s like going to the store and buying a loaf of bread. We don’t have a relationship with our water, and we don’t have a relationship with our food. They are just products that we consume, as opposed to life-giving forces. We must change this idea of water as a commodity. When we see the water as something that lives, then it’s hard to think of it simply as a commodity. We need to care for the water instead of merely use it. If we can do that it will change so many things. I did the Mississippi River Water Walk because I live a block from the river, and I cross it several times a day. I have a relationship with the Mississippi River. But it’s about love. It’s about moving toward something, as opposed to resisting anything. The old people say that if you want peace, you must be with love. One day when someone asked, “Why do you do this? What do you hope to accomplish?” I said I was walking because I want world peace. And ultimately that is why we walk. If we can treat the water with respect and love—not violence—then perhaps that sentiment will spill over into our relationships with each other and our relationships with the earth. What other strategies do you recommend for making more people aware of the importance of clean water and other gifts we share? People need to understand that we face these kinds of changes globally, yet we can all take local action. Walk around lakes. Walk along the river near your home, whatever river that is. Offer that. Meditate. I believe that the water spirits are much more powerful than our corporations and cities. So ask for the deepest truth and purest love through invocation. Then add science. The Milwaukee Water Commons project has been undertaken to surface broader leadership, community partnerships, and momentum for fresh work regarding Milwaukee’s water future. Milwaukee has the ingredients to become a leader in freshwater issues, but it will require a different orientation and pattern of community leadership than is currently at the forefront of the city’s water conversations. Our inquiry process explored the basis for an alternative focus. Building from a commons perspective, one that seeks solutions of shared benefit, shared responsibility and shared stewardship, we engaged 50 community leaders from a range of sectors (the arts, public health, law, urban agriculture, academia, faith, K-12 education, business, and water professionals) in a set of in-depth interviews and two large group working sessions. 1. Water is an essential element for all life on Earth. 2. Water belongs to no one and cannot be owned. 3. We recognize our inheritance of the Great Lakes; they have nurtured our ancestors and shaped us as a people and as a community. They continue to sustain us. 4. We have a responsibility to protect and pass on clean and abundant fresh water to future generations. 5. Decisions about the care and responsibility for our waters must involve all of us. 1. Activating Citizens-We are partnering at seven neighborhood sites strategically chosen to develop local involvement with water issues and stewardship. We are working to expand beyond the familiar circle of water experts and to explore partnerships within the arts, the faith community, public health, recreation and urban farmers to name a few. Our inaugural water leadership training will begin this spring, bringing together residents from our diverse neighborhoods. Each team will then engage in a water related project that will benefit their neighborhood. We will culminate the year with a lakeshore event calling attention to the preciousness of our waters. 2. Fostering Collaboration in the Community-There is a great deal of work happening in Milwaukee. Our goal is to seek out synergies and foster collaboration among and beyond established water groups. Partner organizations will work with neighborhood groups to support their water initiatives and to provide educational, scientific, and artistic support. 3. Leveraging Existing Capacity and Resources for Local Solution Making-One of the most important connections is the interface between the University of Wisconsin’s School of Freshwater Science and the Community. We will explore ways to better leverage and integrate the research expertise and capacity of the school in local policy and community water challenges. 4. Developing a New Public Narrative of Milwaukee as a Water City-The power of narrative to shape the public conversation is increasingly recognized in social change circles. We need a story that puts community and water stewardship at the center of the Milwaukee landscape. We will work across several platforms-social media, websites, the arts, events and two documentary films to tell our story and to document the emergence of new community water leadership. 5. Linking Milwaukee to the Great Lakes Commons and Bio region-The work we are doing in Milwaukee-from organizing citizen leadership to fostering collaboration and defining a new narrative is breaking ground. We stand to gain, to learn, and to share new learning as we progress. Ultimately we need our local water efforts to encourage bold citizen leadership across the bioregion and to grow a network of Great Lakes Commons leaders that can draw strength from working together. March 22 this year was the United Nations’ World Water Day. This designation by the UN seems extremely appropriate, given the complex threats facing many other water bodies around the world, including our own lakes, as well as the great work being done by many groups working together to create new ways to collaborate on and solve water issues. Although the day is passed, 2013 is still the year of “Water Cooperation." Now is the perfect time to join the efforts of all the communities working together on water issues around the Great Lakes! Click here to participate. James Rowen is an environmental policy blogger at The Political Environment. Rowen recently released a report on the critical state of water resources in Wisconsin. Despite Wisconsin's Public Trust Doctrine and Native American treaties that Rowen cites as examples of legal documents declaring that "Wisconsin's Waters belong to everyone," current state politics threaten Wisconsin's water resources. "Partisan disdain for principles water policy, science and law emerged in the early hours of Governor Walker's administration," writes Rowen. The Governor's administration has helped developers avoid environmental reviews, encouraged building in wetlands, and allowed the expansion of high-capacity wells without assessing their cumulative effect on the ground water table. "Imagine if authorities were to allow developers to build multiple 10-story parking ramps without studying the cumulative impacts on traffic." Walker is also enabling mountain-top removal in an iron mine in the same watershed as the Bad River, one that "would be upriver from public drinking water supplies and close to wild rice producing estuaries central to the survival of the Bad River Band of Ojibwe (Chippewa). [This] would allow, despite scientific testimony and other warnings, the dumping of millions of tons of acid-yielding waste rock across more than 3,000 acres and into streams and wetlands." The report demonstrates not only how the commodification of water resources can lead to unjust distribution of costs and benefits or to unsustainable resource depletion, but also how it can corrupt policy and politicians when it comes to water issues. Even though Wisconsin is bordered by two Great Lakes and the Mississippi River, protection of water resources in the state is imperative. A little fill here and there may seem to be nothing to become excited about. But one fill, though comparatively inconsequential, may lead to another, and another, and before long a great body of water may be eaten away until it may no longer exist. The Toxic Substances Control Act, a piece of legislation that gives the United States Environmental Protection Agency (EPA) the authority to regulate toxic chemicals, is failing to protect our Great Lakes and our public health. Over 20% of the shoreline of the Great Lakes are impaired due to sediment contamination, and 33% of the 1,305 sites in the United States are in the Great Lakes Region. The Safer Chemicals, Healthy Families coalition has released a report stating that the EPA has required testing of fewer than 200 of the 26,000 chemicals that were grandfathered in under the law when it was passed in 1976 and that newer chemicals (that are actively being used in common products and often find their way into water bodies) have not been adequately addressed. "These newer sources of contamination include bisphenol A (BPA), phthalates, alkyphenols, 5-methyl- 1H-benzotriazole, synthetic musks, Triclosan, polybrominated diphenyl ethers (PBDEs), and other flame retardants. Many of these emerging chemicals of concern come from non-point sources. Some leach from landfills, polluting lakes, rivers, streams, and ultimately contaminating the Great Lakes. Many chemicals are also widely used in both consumer products and in industrial applications, and are released during production, processing, use, and disposal. However, these chemicals are not yet, for the most part, regulated by the U.S. under TSCA. According to Environment Canada, emerging contaminants like BPA have been found in surface water, groundwater, drinking water, aquatic species, sewage sludge, soil, sediments, and other spots in the Great Lakes basin. We collaborate with all sorts of allies--stakeholders, policymakers, advocates, etc.--to bring about positive changes to the Great Lakes. In order to make these changes sustainable into the future, though, we also need to work with another important demographic: kids. Children will become the innovators, change-makers and commoners of the future, and they will carry the torches of our causes and the costs of our decisions today. Education is an integral part of our work to establish the Great Lakes as a Commons and protect it for future generations. 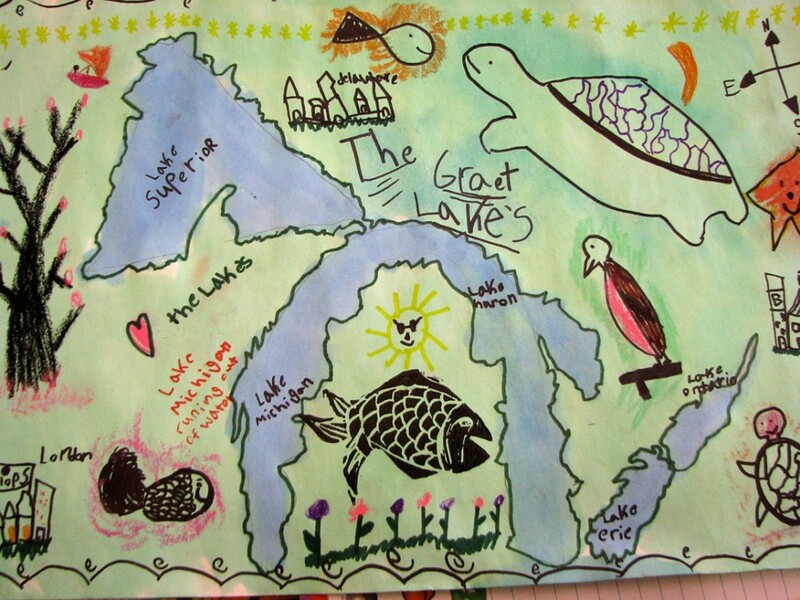 Students in the area of London, Ontario, recently learned about environmental problems and the Great Lakes through a pilot Environmental Art Project program funded by their local arts council. The goal of the project was to encourage students to consider problems around the Great Lakes through art media. For instance, one assignment had students learn how to draw the lakes by looking at the shapes (an equilateral triangle, a moustache, two peanuts, etc.) and painting the land and the water. Students studied the watershed, animals and plants and reflected on how important water is to their lives. 2nd and 3rd Graders in Laura Mills' class at Delaware, Ontario, Public School. The "triangle, moustache, and peanut"! Picken-Cooper was originally inspired to focus on the environment in her work after hearing Maude Barlow speak at her convocation from Althouse College at the University of Western Ontario. “I had no idea who Maude was or what she was talking about, but she was inspiring, articulate and passionate... this sparked my curiosity, so I went to the library and got out all of her books and started to read.” Picken-Cooper then began to focus her work on environmental problems, including a show about trees with H.B. Beal Secondary School in London that raised $1000 for a local nonprofit. Programs like this and the Haggerty Museum of Art’s Water Across Curriculum integrate ideas like water or trees into the classroom and free students from the confines of the textbook, allowing them to think about things in a different way. “Thinking about things in a different way” is becoming more and more important when considering the future of our endangered commons like the Great Lakes, and the minds of children are an excellent place to start. This article is cross-posted with permission from the Council of Canadians in-house magazine, Canadian Perspectives. This article is written by Emma Lui and the original can be found here. All around the world bottled water companies like Nestlé are depleting freshwater sources to make money. The Council of Canadians is part of the fight to say “no” to corporate greed over water, and fighting for it to be recognized as part of the commons – a shared public resource for all. The Council of Canadians and Wellington Water Watchers (WWW), with legal representation from Ecojustice, are parties to a legal case involving Nestlé’s water withdrawals in Hillsburgh, Ontario. In February, the two groups won the right to challenge a proposed agreement between Nestlé and Ontario’s Ministry of Environment (MoE) that would permit Nestlé to take water from a shared water source during low water conditions. The agreement stems from Nestlé’s appeal of conditions in their Permit to Take Water, requiring the company to reduce its water takings during times of drought. Nestlé has been withdrawing water from a deep aquifer well in Hillsburgh, Ontario since 2000, paying $3.71 for every million litres that it removes from the watershed. Last September, the MoE renewed Nestlé’s permit for another five years. The permit set out a mandatory restriction requiring Nestlé to reduce its maximum allowable water taking by 20 per cent during times of moderate drought. On October 15, 2012, Nestlé filed a Notice of Appeal with respect to the permit, arguing that the mandatory restrictions were not being applied uniformly throughout the watershed, and that water-taking restrictions should be implemented by conservation authorities, not by the Ministry. The Council of Canadians and WWW applied to intervene in the case, which both Nestlé and the Ministry argued against, but the Environmental Review Tribunal ruled in favour of our intervention because of our genuine public interest in the case. 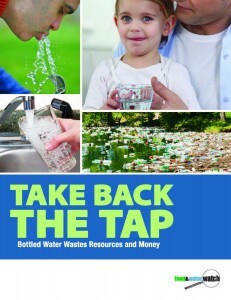 Earlier in the year we formally requested a review of Ontario’s water-taking permit process as it applies to licences granted by the province to bottle water, urging Ontario to overhaul its “outdated and narrow approach.” We argued that the permit process is inconsistent with the Public Trust Doctrine, which asserts that certain natural resources, including groundwater, belong to all Canadians and cannot be privately owned or controlled. The doctrine recognizes the inherent importance of natural resources to individuals and to society as a whole. The Public Trust Doctrine requires that governments fulfill legal responsibilities of a “trustee” and manage natural resources for the benefit of present and future generations. It embodies key principles of environmental protection, including stewardship, communal responsibility and sustainability. Essentially, under the Public Trust Doctrine, the government holds the natural resource in trust for the benefit of the public – now and in the future. The Council of Canadians and WWW are concerned that under the agreement struck between the MoE and Nestlé, the company will be allowed to take up to approximately 1.1 million litres of water per day from Hillsburgh for its bottling operations in Aberfoyle even during times of drought, which have recently affected the area. The City of Guelph issued a red alert last summer requiring a 20 per cent mandatory reduction in water use from Guelph residents because of drought conditions. Wellington County farmers, livestock producers and residents were seriously impacted, experiencing the worst drought in over a decade. Guelph/Eramosa Township, located at the southern end of Wellington County bordering the city of Guelph, was on Level II drought restrictions (yellow alert) well into November of last year. Water sources are under stress from increasing commercial use, population pressure and drought-inducing climate change. A 2010 Statistics Canada study has warned that renewable water in southern Canada has declined by 8.5 per cent from 1971 to 2004. Water-taking decisions that approve large commercial uses without considering the long-term needs of the local community and environment could seriously impact freshwater sources. Because water is a fundamental resource, the Council of Canadians and WWW will argue that the Ministry’s permitting process must recognize the urgent need to protect it in a time of growing stresses. Provincial governments are legally responsible for the protection of groundwater supplies. Ontario and other Great Lakes jurisdictions have committed to a precautionary approach in managing water. This sort of approach stems from the precautionary principle, which says that where a risk of serious and irreversible harm exists, lack of full scientific certainty should not prevent measures to protect the environment. This case presents an exciting opportunity for the courts to recognize that the Public Trust Doctrine provides a valid legal basis for adding drought-related conditions to Nestlé’s water-taking permit, and to prioritize public rights to water over private, commercial uses.